Kramer Electronics and Calibre UK announced a joint marketing and product development partnership at ISE 2014 in Amsterdam, allowing Kramer to expand into live events, specialist fixed installations—like museums—and broadcast verticals. Calibre will be significantly boosted by Kramer’s 35-country strong sales, marketing, and support network to expand well beyond its mainly European reach. 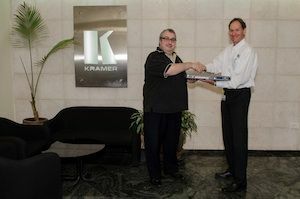 Tim Brooksbank, chairman of Calibre UK and Aviv Ron, Kramer’s VP business development and strategy at Kramer’s head-office in Jerusalem, with one of their first joint products, the VP-794 scaler, announced at ISE 2014. The first co-branded product is the VP-794 universal live events scaler enabling scaling, blending, and warping of complex video wall installations. There are already five new co-branded products, which “greatly expand the range,” according to Tim Brooksbank, chairman, Calibre UK. Over the next one to three years, there will be great growth in specialist high-end products available from Kramer. Brooksbank noted that Calibre believes in “partnering when relevant.” He will be managing the new product range within Kramer. The VP-794 can switch between LED, projection, or scaler/scan converter modes, attractive features for the rental and staging market. Based on Calibre’s HQView architecture for low latency scaling to arbitrary active image sizes, the VP-794 features dual processor architecture with 16-bit professional-grade blend processing. The scaler is capable of capturing a live image for display as a still, with the ability to scale, warp and blend this image. The VP-794 offers per input channel RGB, Bri/Con/Saturation/Hue controls, including on digital and computer graphics inputs for color matching images and displays on set. The VP-794 video inputs include HDMI, DVI, VGA, Component, Composite, YC/SVideo and 3G-SDI inputs and Separate Genlock. Audio pass-through and de-embed is achieved from 3G-SDI and HDMI to 3G-SDI, HDMI and SPDIF. The VP-794 has a built-in test pattern generator, including custom downloadable test patterns that are accessible via web browser interface. Kramer has never had a product like the VP-794, noted Ari Gorlin, Kramer VP of sales, although the company has “dabbled” in some of the markets the Calibre partnership has opened up for it. All of the product marketing will be done through Kramer, although product development will be a joint effort. Other benefits for Calibre include a guaranteed route to market, as well as lowering the risk of further R&D investments.